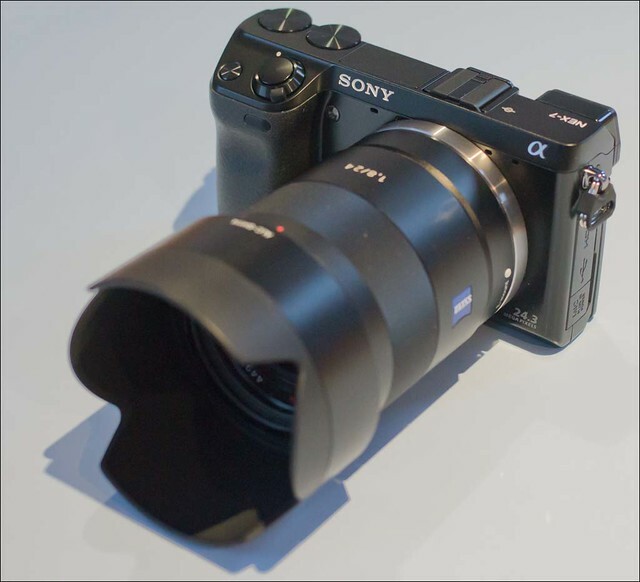 Sony NEX-7 arrived today somewhat unexpectedly. Having only pre-ordered a NEX-7 body, after cancelling an order for the kit (On Andreas advice at SonyAlphaRumors - so thanks for that) on 22nd. December, I was surprised to get an email from the Sony UK online store yesterday saying it had been dispatched. It duly arrived today. Considering that they also charged me £848 for it, about £150 less than most other stores are charging in the UK, I was pleased. It works too! There are obviously some arriving in the UK as I've seen others saying they have got them. Smaller than I was expecting. 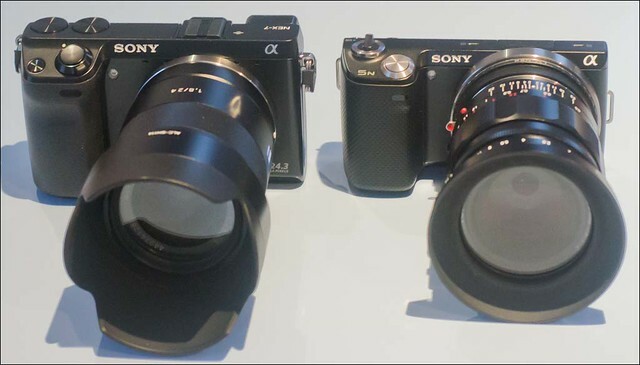 Its not much bigger or heavier than my NEX-5n's. The viewfinder seems exactly the same as the add-on one for the 5n. It takes a bit of getting used to with it being right on the edge of the left hand side of the camera, but it does stop my nose hitting the screen all the time which is useful. The camera switches between EVF and screen a lot faster than the a77. The thumb wheels, which are set up with aperture and shutter speed by default are great. Very quick and easy. As is expected, very similar to the a77. In fact virtually identical. Its no low light king, thats for sure. 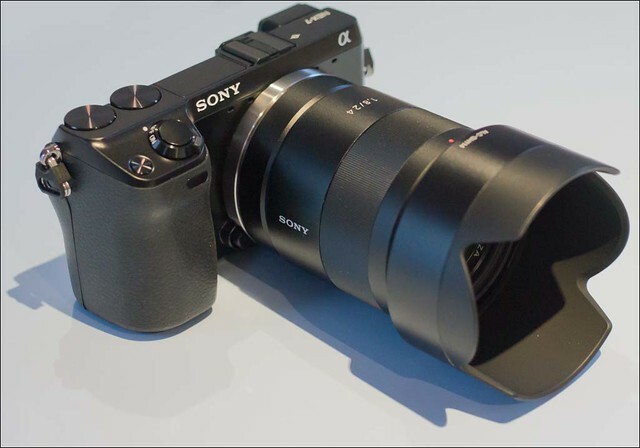 The NEX-5n beats it hands down for that. Because I'm able to use the Zeiss 24mm and m-mount lenses on it, I suspect I will get sharper results than from the a77, and my initial test shots seem to bear that out. Is it the digital AF Leica? Well I'm certainly not going to answer that question after a few hours, but it seems a very nice camera. Probably not the answer to life, the universe and everything as some seem to suggest, but if you want a monster sensor, and fast easy handling in a small light package, as I most certainly do, then it looks very promising. I'll be reporting on my adventures with it in the usual way, and I suppose it will end up as a review. Bit I'm not really going to promote it as such. I thought what I would do, is since I own all the current NEX lenses, 3 m-mount Voigtlanders and 4 a-mount lenses plus the mirror adapter, I'd write about how it works with all the lenses, plus feed in my impressions as I go along. If you are desperate to get your hands on one and live in the UK, then I'd certainly recommend the Sony UK Online store. Presumably they receive the first ones anyway, and they certainly, somewhat unusually, have the best price. To finish here's a couple of comparison shots of the NEX-7 with the Zeiss 24mm f/1.8 and a NEX-5n fitted with the Voigtlander 35mm f/1.2 Nokton.